This entry was posted on April 8, 2010 at 12:00 pm	and is filed under Food. 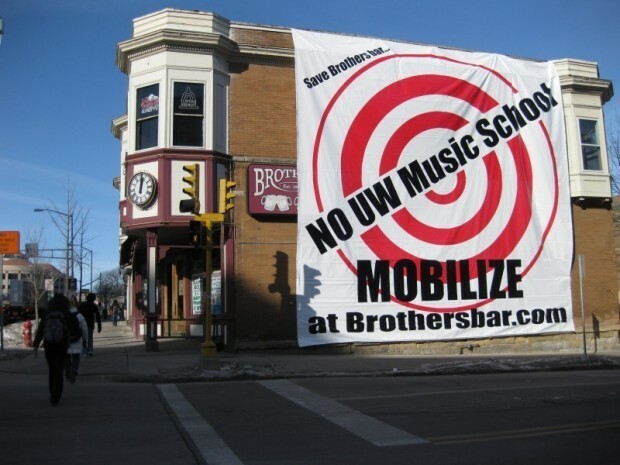 Tagged: brothers-bar, poster, school, uw-madison. You can follow any responses to this entry through the RSS 2.0 feed. You can leave a response, or trackback from your own site. 1. Brothers recognized that their only supporters are the frat scene and the sign was an attempt to reach out to them. Unfortunately trying to mobilize the frat scene to do anything is a recipe for failure. 2. Any publicity is good publicity. Entirely plausible. Although they, like the other frat bars, have a line out their door most nights, so it doesn’t seem that useful. Perhaps they need the publicity so people will remember they exist and will seek them out when they move. Finding replacement space nearby will be hard, so they may move out of sight of their old location. 3. The owner is irrational. If the owner gets it in his or her head that they’re being personally wronged, they may irrationally fight well beyond the point of reason. My job has exposed me to a similar situation where an irrational person has been fighting the UW for years, rejecting very reasonable compromise offers, and almost certainly losing piles of money to lawyers. A lot of the stuff in their area has already been knocked down for new buildings including University stuff and the stupid proliferation of condos that’s been going on for the last few years. I suspect they’re going to have a very hard time finding anywhere nearby to move to.